The area just within the city wall – the Great Wall Road – is kept clear of buildings. In times of siege, or when the monsters of the wild lands press close, that broad space is used to muster and drill troops, to rush supplies and reserves to wherever they are needed, to hold the livestock that will be butchered to help feed the city, to stockpile supplies, to rally the militia, and to watch for signs of sappers. It’s where the priests set up to bless the walls and heal the defenders, where sentinels watch for infiltrators, and where – on rare occasions when dark powers are abroad – the mages and priests work to reinforce the wards and protect the entire city. Buildings too near the the wall would interfere with all of this, and would be a hindrance and fire hazard in times of war – easy to ignite from the outside, and thus a peril to the wall and it’s defenders. There are an assortment of wells near the wall and pools by the buildings within, which serve to supply water and firebreaks for fighting fires, to add a margin of safety against incendiary missiles, and to farm fish – in addition to being decorative and providing relatively safe places for children to splash about. The Town Wall has proved it’s worth many times. It helps to keep monsters, and bandits, and hordes of orcs, and similar hazards at bay, serves as an anchor for the cities wards, and provides sheltered yet elevated posts for sentinels. The Wall Road, (or Wall Street), is an important part of the Town Wall. It’s maintenance is a military matter; you can’t build there. That doesn’t mean that you can’t hold fairs and markets and put up tents. You can even put up rather long-term tents arranged in sprawling communities. You just have to be ready to fold them up and get out of the way when one of the periodic drills is held. Those sprawling communities of tents are home to many of the cities poor – and when they’re knocked down, or a fire breaks out, or there’s a sudden monster attack, or any of a dozen other disasters happen, they are swept away – only to rise again as soon as it’s relatively safe. These are the Tumbledowns – a bustling circular market/slum/tent carnival filled with colorful tents (the merchants pay apprentice mages a few coins to pass through the area and cast coloring cantrips on the drabber ones; it helps keep the customers enthused), outdoor games, very junior craftsmen and merchants manning their booths, the cheapest of mystical services, prostitutes, and even more dubious services, stray children, salesmen hawking their wares, the farmers markets (patronized by the poor seeking the cheapest of overage foodstuffs and by the servants of the rich, seeking the freshest), lines of washing, pushcart-vendors, day-laborers looking for work, and the most petty of petty thieves. 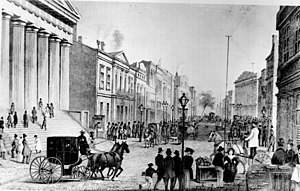 The occasional larger events, such as traveling entertainers, gypsy caravans, visiting religious preachers, magical duels, and so on, may either clear a space or – for a modest payment to the city and as long as they are strictly temporary – briefly use one of the practice grounds the city keeps clear to train the militia in. Inevitably, the area is hazy with dust and smoke when it isn’t muddy. Evading pursuit is easy enough in the Tumbledowns – but evading notice and recognition is very hard indeed; few keep as sharp an eye on their possessions and possible threats to them as those who have very little. It’s always easy to wave over an urchin child and give him or her (it’s often hard to tell the difference) a half-copper to guard your wares, run errands, keep an eye on someone, get a recitation of all the local rumors and news, carry your packages, or locate the less legal (and more mobile) services. Working for farmers at the markets is especially popular with the kids; the farmers often pay with a really good country meal – plentiful, and sometimes with a bit of actual meat in it – instead of with hard-to-come-by coin. While the troops stationed along the wall will intervene in major disturbances, really petty thievery and cheating – a bit of short measure, a thumb on the scales, or shortchanging some rich adventurer – is rife in the Tumbledowns. Still, anything much more than that attracts too much notice eventually, usually resulting in a few more gruesome executions, public punishments, or slave-sales beside the western gate. The Tumbledowns do NOT host the great fairs – the major mercantile gatherings which bring in so much of the towns money in fees and taxes (and thus are tightly controlled, regulated, and taxed). Most of those are held in the fields beyond the gates, although the most expensive goods and biggest deals are often handled in small private meetings in the more expensive inns without anything so crass as actual goods or money ever putting in an appearance.